I got the shelf guides in on one side today. They are spaced 7” between each shelf, that should be plenty of room I’m thinking. Looks good to me. Any more racks and it gets cluttered in a hurry. I got the top of the CC on and all the doors cut out. Before I mount the doors I would like to get some gasket material so I know where to mount the hinges so I get a good seal. What is everyone’s favorite gasket brand or materials? I’ve been looking at the LavaLock and FireBlack as potential winners. I look forward to your input, thanks! I used the lavalock 3/16x1/2" on my doors and it works well. I can run my probe wire through the doors and it stays sealed. Ditto...lava rock has held up great for the last 3years. Skeptical of the “self stick” but it is still holding and shows no sigh of failing anytime soon. Cooking grates are done and doors should be on in the next couple days. Getting close! Looking good. Fair bit of shelf space there. I bet you can't wait to get it up and running. Looks great, when does the brewery open? I'm hungry and thirsty. Hopefully the brewery will be open late April or May. I can’t wait to fire this pit up and lure people in with the amazing aroma from the smoker. I got the firebox almost done. I need to make a door latch, handles for the inlet doors and a basket. Any general rules for how big the basket should be or just make it so it fits thru the door? A lot of guys are building a tapered fire basket that's wider at the top and narrow at the bottom to keep the coal bed centered in the basket. Another thing is to keep the side of the basket closest to the door low enough that you don't have to pull it out to add wood. You may want to move your grate higher in the firebox. Mine was low like yours and the ash would pile up as high as the grate. 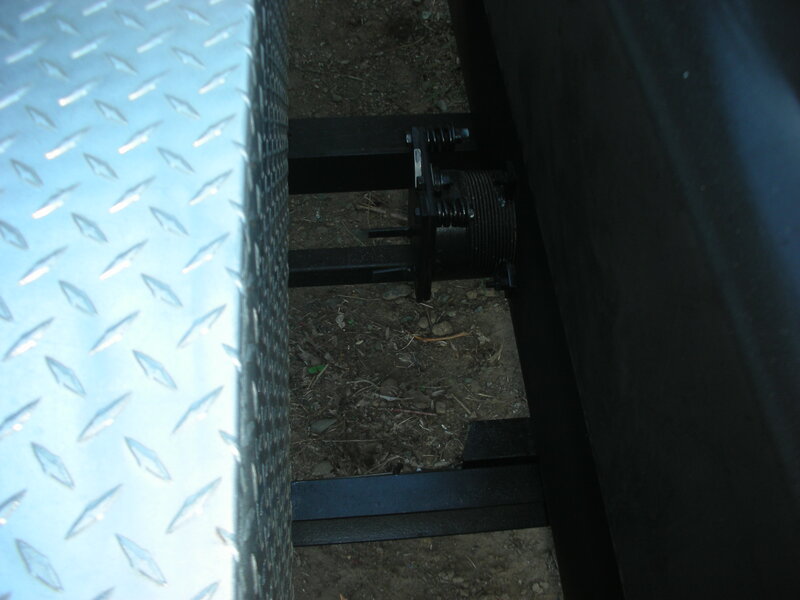 The higher grate also allows room to pre-heat your splits too. I made some handles today out of some Model T emergency brake levers, Model T valve springs and some rebar. The handles turned out pretty cool. 30931163-20BE-491D-A7C5-FB7362492F92.jpegThe handles turned out pretty cool. Man I have been sleeping on your build. It’s coming along great. Question...How long is is or was the tank to start? Question. With the squared doors, will there be a hearing difference on the top shelf where it sticks out more than the bell of the barrel? As long as your doors are closed, the heat should equalize fairly quickly in the chamber. Every cooker has cool spots tho so keep an eye on it. If it is, just rotate the meat half way thru and you should be good. I’m back to work on the smoker after a little break, I was hanging sheet rock in the brewery. I made a charcoal basket and got several sides of the firebox insulated and sealed up today.